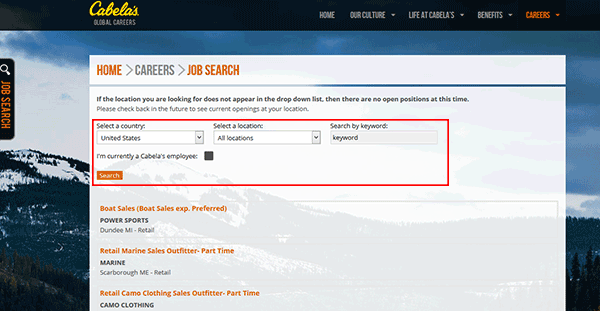 There is currently no printable Cabela’s job application available (the application can only be filled out/submitted online). Read the guide posted below for more details on how to search/apply for current openings. Numerous types of positions can be applied for online (including both corporate/global careers and in-store/hourly jobs). About the Company: Cabela’s is an American retailer of outdoors-related products (fishing, hiking, camping, hunting, etc.). There are over 80 locations throughout North America (United States and Canada). Step 1 – Use the link at the top of the page to go directly to the employment/job search page (note: right-click and open the link in a new tab/window). Step 2 – Search by country, location (state/region), or keyword. Step 3 – Scroll down the page to view the results. When you’ve found a job that interests you click the title to go to the job description page. Step 4 – Read the job description, functions, and requirements. 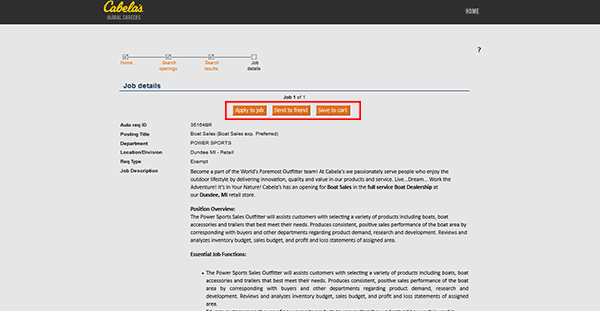 When you’re ready to begin, click the “Apply to Job” button (outlined in the screenshot). Step 6 – Profile Source – Import your profile data from your LinkedIn profile (or select the “build using this site” option). 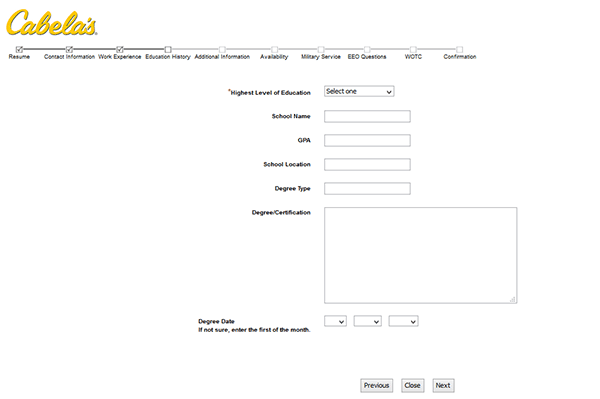 Step 7 – Resume – Upload your resume/CV (optional).